I wasn’t planning to catch Pitch Perfect 2 despite hearing all the great reviews about the film. But obviously, I did in the end, and I was glad I watched it. In fact, it is a film where you don’t mind watching it over and over again. While the first film in 2012 was about freshmen Becca (Anna Kendrick) joining the Barden Bellas and having a forbidden relationship with their alpha rival group, the Treblemakers, the second film 3 years later lands them in a more “international” form of trouble. After Fat Amy (Rebel Wilson) made a mistake, the three-time champions lost their name and performing rights to the German champions DSM. They had to compete on an international level to get back their performing rights. The Bellas never failed to give me goosebumps with their voices every time they performed, so although the DSM were “pitch perfect”, the bellas went beyond and touches heart. I was able to relate to this film, as it reminds me of my graduation period. The Bellas passion for a Capella and the emotional moment when they had to decide whether to graduate or continue was almost like a Déjà vu. Kristen Wiig was originally offered the role of Gail in the first movie, who was later replaced by Elizabeth Banks. Elizabeth Banks is now directing the sequel. Elizabeth Banks’ directorial debut. Yes, it’s the very same Elizabeth Banks who did Effie Trinket in Hunger Games. Anna Camp is dating Skylar Astin in real life, but Anna Kendrick is his on screen girlfriend. Kay Cannon, the writer of Pitch Perfect 2 (and its predecessor) has a cameo as a news reporter after Fat Amy (Rebel Wilson) flashes the president. At one point Anna Kendrick’s character is referred to as a troll by her German counterpart Komissar. As of this post Anna Kendrick is voicing the lead in Dreamworks’ animated film Trolls (2016). 44th President of the United States Barack Obama and First Lady Michelle Obama appear in the beginning of the film. Footage of them was edited in from the 2013 Kennedy Center Honors reception, held in the East Room of the White House in Washington on December 8, 2013. The famous a cappella group Pentatonix is making an appearance in this movie. There’s a mid-credit scene at the end of the movie, in which Bumper auditions for The Voice. This scene features all four coaches for Season 8. (Adam Levine, Pharrel Williams, Blake Shelton, and Christina Aguilera). During the end credits, there’s an extra scene where Bumper is auditioning for The Voice (where he ultimately chose Team Christina) All of the crowd were not extras, but was the actual crowd for that days taping of the Blind Auditions. They thought it was a huge joke! The Film features the original song by Anna Kendrick, “Cups.” It was also featured in the first film when Anna’s character, Beca was auditioning for the Bella’s. This song is actually derived from an old bluegrass tune. The version in the movie is a cover of Lulu and the Lampshade’s version. Check out Pitch Perfect 2 Official Website and Facebook Page! 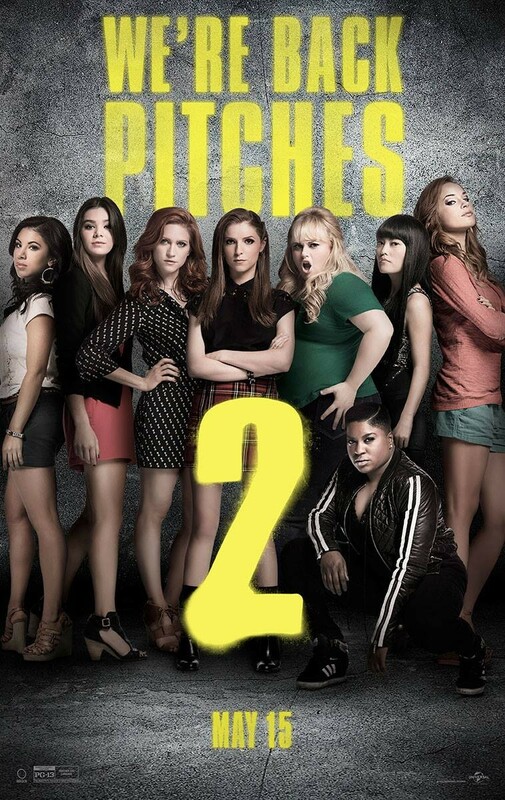 Pitch Perfect 2 is out in cinemas on 14 May 2015. My friends all couldn’t believe it when I tell them I haven’t even watched the first Pitch Perfect movie yet! Lol! 😀 Anyway, will have to watch the first one before even attempting to watch this sequel. I have seen the first movie of Pitch Perfect that’s why I’m interested to watch the sequel too. I heard good feedback to but I haven’t watched it yet. Let me check if I can catch up but I’m sure I would love this one and have a lot of laughs. I haven’t watched the first movie, but I’ll skip that one in favor of this. I hope I don’t get confused too much. I actually want to watch it when it first day showing! But it crushed with my holiday. So haven’t watch it till now. I already watched this, and the movie is perfectly satisfying. So proud also with the Philharmonic group which is also here in this movie. I love all their songs! I have to see this movie yet. Actually, I really didn’t wanna see it too because I always end up still liking the first movie. But it is the good reviews such as this that urge me to see it. After the first movie, I did research about Skylar and was really surprised that him and Anna are going out! But I think they make a lovely couple. I missed this one as well on the big screen. My friend in the office told me she watched and enjoyed this one. Makes me want to grab a copy when it becomes available on dvds. I would love to see this movie. I’ve been seeing great reviews about this. While I enjoyed the film and wanted to take voice lessons after, there were some parts in the movie that seemed like shouldn’t have been there. That, or it appeared that they tried to squeeze in a scene as a filler like it wasn’t really part of the story. Despite that, I did like Pitch Perfect 2 and it was such a good watch after a long at work. This is one film I admit like watching. I love funny movies eh.